For this month’s MarketWatch we’re going to focus on a growing segment of collecting in the hobby: store displays. Now, the segment has been around for years as a sub-genre that creeps into collections big or small. However, the past two years have seen incredible growth in awareness of the segment. Much like mailers and proofs, displays are a growing segment not just for focus collectors, but for casual collectors as well. We’ll review some of the big display auctions in recent history, and show some of visually stunning pieces that make this such as attractive niche of the hobby. A major reason these have become so popular lies in the fact that many collectors collect packaged items. 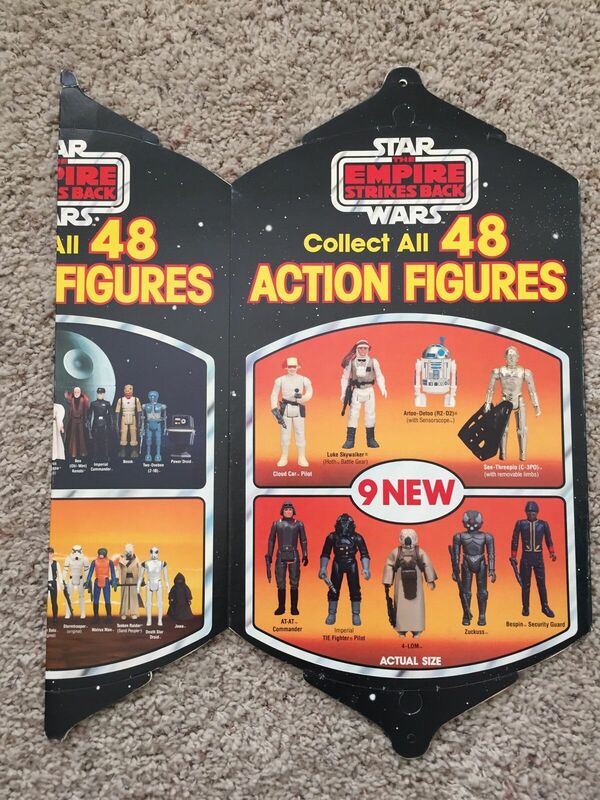 So many of us are enthralled with the classic Kenner imagery from packages, and while the outside of a box or the cardback of a figure was supposed to be informational, the sole purpose of these displays was to sell product! 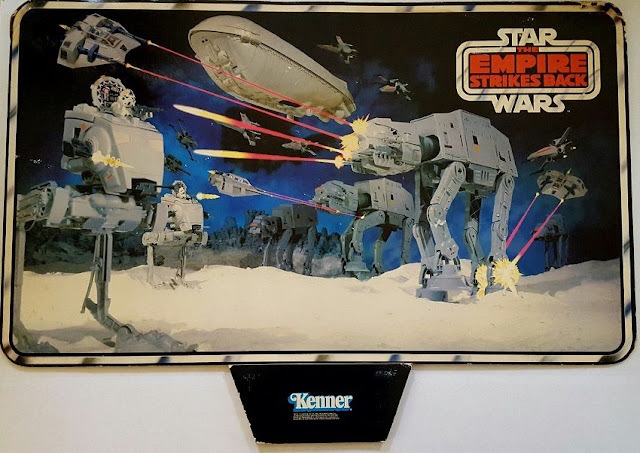 And thus, Kenner put their best foot forward in making the displays for the products sell the products themselves while reinforcing the success and excitement of the movies -- something that’s really not that easy in a two-dimensional medium. Displays come in all shapes and sizes: standalone cardboard corrugates that sit on the floor, PDQ trays that sit on shelves, items that were made to hang from the ceiling and even point of purchase items such as shelf liners (or as many collectors refer to them, "shelf talkers"). Ultimately, there are a plethora of different types of displays. The most common and popular among collectors because of their availability and the fact that they were some of the most visually appealing are the header displays. These cardboard creations either hung from the ceiling or sat on the back of a corrugate or PDQ tray. Store header displays are fairly unique in that most people need something to house the items in. For more on framing or grading these pieces, we recommend that you look to eBay, Rebelscum and the Displays and Advertising Facebook group for more information on what some others in the hobby have done. One thing that must be remembered about this segment and any segment of collecting is that condition has a huge impact on price and value. When it comes to displays, there’s a little give and take to that. We have to remember that these were created to be discarded and many never saw a residual value in them like the actual toys. Because of this, we see rare displays hold their value even with condition issues. However, more common displays like the Boba Fett Header lose the majority of their value when damage is present. Because most of these are cardboard, they are susceptible to many different forms of direct and indirect damage due to environmental issues, poor storage conditions etc. It’s one aspect that makes this one of the most rewarding, but difficult to collect segments in the hobby. Going in numerical order from high to low, our first display is typically found much higher up the food chain. Here we have one of the two character headers released for the Return of the Jedi toy line. This is a two sided display and one of few that has a different image on each side. Now, the piece itself is middle of the road in terms of rarity, but being a header display that features two different sides, it’s fairly unique and can demand up to $3,500 for a high quality example. The example we have here is far from perfect. There are several spots of wear along the edges on both sides as well as well as water damage along the top. The realized price of $772 shows that condition is even more important in this segment than in many others for collectors. When you think that this will more than likely get hung on a wall and that the framing or grading costs are cheap, it starts to become a much less desirable piece. For those entering the hobby and specifically this niche, it’s always good to remember that price is in some way shape or form tied to condition. And that’s the case with our next auction. 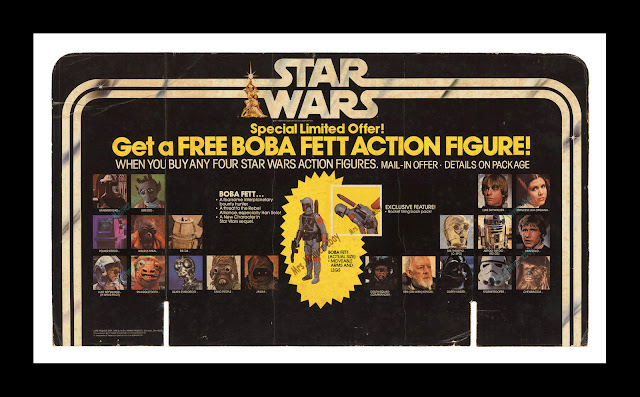 The Boba Fett 21 Back Header is one of the most popular items in the category of store displays. Being part of a trifecta of Boba Fett displays (Long Header and Bell being the others), this particular one is the most common of the group. Even though it’s the most common one, in good condition it can command between $3,000 and $5,000. Here we have a fairly beat up example that still commanded a fairly strong price at $1,595. A great piece for a starter collector or someone who is just looking for fair grade item. The next item up is a Toy Center Shelf Talker from the original release. Now, this particular piece is unique in that it’s never been used and more specifically, never folded over. The piece looks to be a perfect as it could possibly be. This is a really rare example as the Toy Center shelf talker in itself is fairly sought after and an example like this is very difficult to find. Given that there were so many other pieces for the Toy Center series, it hopefully went to compliment that run. This next piece is really special. 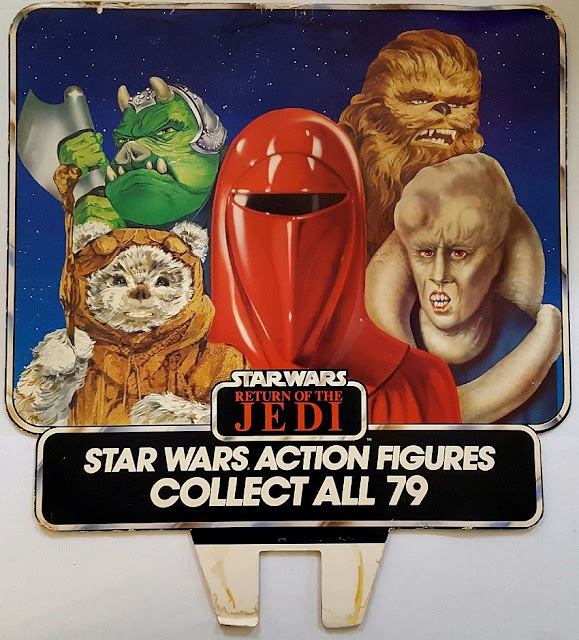 As the toy line grew and grew, Kenner did something that is very rare in the toy industry: they continued to promote and produce prior runs of characters in new packaging. 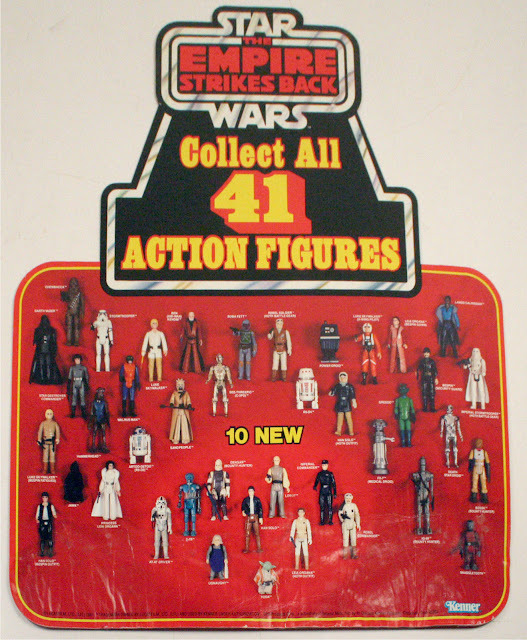 By the time the 48 Back figures were on shelves it was getting very difficult to fit all of those figure onto a display. And what did they do? They got creative and designed a multi-sided hanging display that showed all 48 characters in the series. This was a three-dimensional feast for the eyes and very few have made it through to this day. What’s really unique is that in Kenner fashion, they didn’t just blast all the figures randomly onto the display. 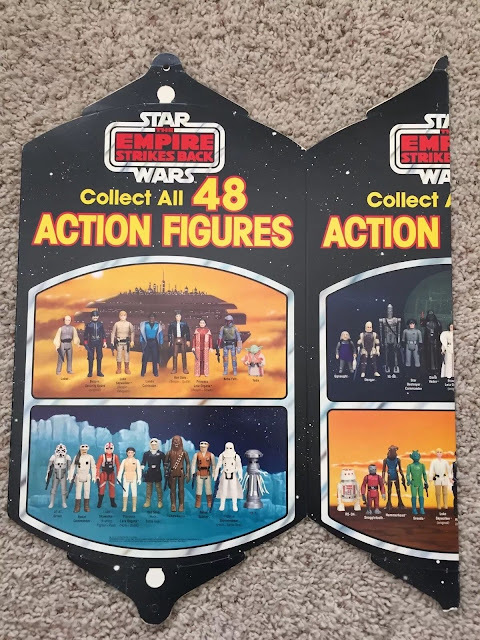 They used Kim Simmons-style photography to group the figures into their sub-families with the Hoth figures in one image, Bespin in another, the Bounty Hunters in another and so on, with a another side focused on the 9 new figures in the line. This truly was one of the best items from a visual perspective that Kenner ever released. As I mentioned, not many have survived to this day, and in the case we’re presented with we have all the pieces, but its been cut down to lay flat. Even with that in mind, the display commanded an impressive $4K at auction on eBay. Our next display also hails from the ESB line. Here we have the Collect All 41 character display -- one of the last displays to feature all of the characters released in the line to date. As Kenner found out with this display, it was getting more difficult to fit all the figures onto one display, so as we saw with the previous auction they moved to a three sided format with the 48 Back displays. Thus was the end of the two-dimensional full catalog displays with this item. Like many displays, this particular one are few in total numbers in collections today, and like many it commands a high price even with some condition issues as seen in the images. Moving back to header displays, we’re treated with another rarity from the ESB line. 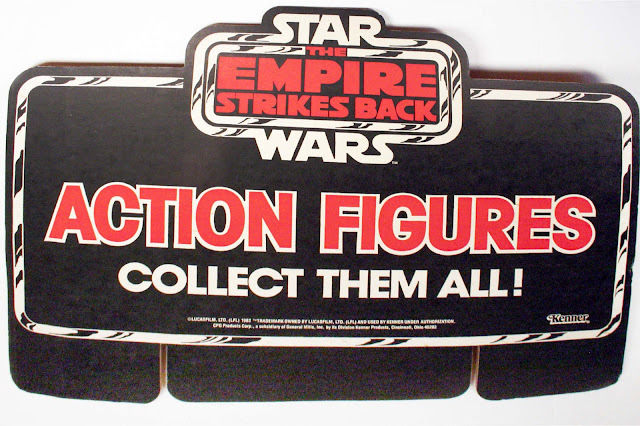 This header for a toy bin is one of the few from the series to show an action shot, and they fit a lot into it. You have AT-ATs (Pronounced @ @), shooting snowspeeders, rebel transports flying over head, AT-STs thrown in there, and all of it taking place on Hoth and superbly airbrushed to reinforce the action that is taking place. 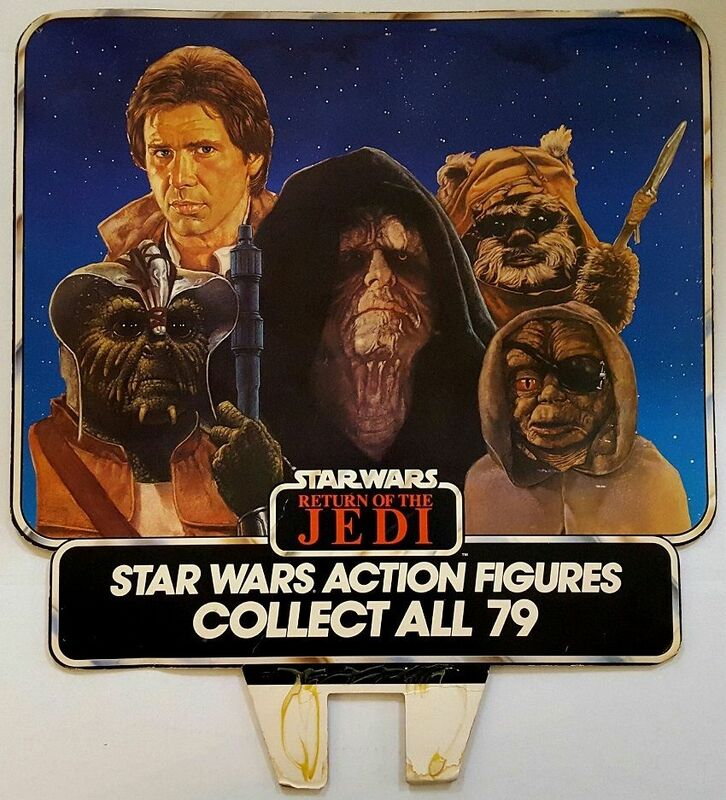 This piece does have some wear to it, but is in overall good condition and thus commanded a strong price of just under $5K, making it one of the more expensive Vintage Star Wars pieces on eBay in the past year. Earlier we were treated to a very unique unfolded header from the Toy Center series of displays. 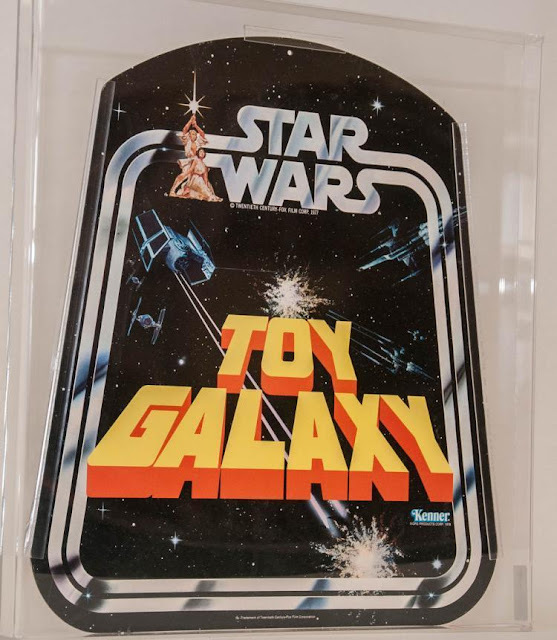 The Toy Galaxy series is actually one of the more common, but demand for good examples has always been high. Here we have an AFA-graded header from the series which shows just how well they encase these items. Whereas proof sheets can be overwhelming to be graded both in weight and size, headers -- especially bell headers -- fit nicely into a smaller, lighter case. This particular piece was part of the Sellersville auction earlier this summer, and like most things in a true auction house commanded more than what I believe we’d see it sell for on eBay alone. One of the things that's interesting about displays and plays out to some extent in the rest of the hobby is that in a lot of cases, the less intricate an item, the more desirable it is. While our last ESB header was detailed and featured a great deal of depth and attention, our next item is one of the most simple displays out there. This is the ESB Collect Them All display, a three color (black, white and red) display that is as simple and straightforward as anything in the Vintage line. This particular piece is fairly sought after being one of the rarer headers from this era, however what makes this auction particularly expensive is that this is a new, unused header display. Our last item of the month has several things going for and against it. Regardless, it’s the most expensive auction in our feature and has everyone in the display collecting community buzzing. 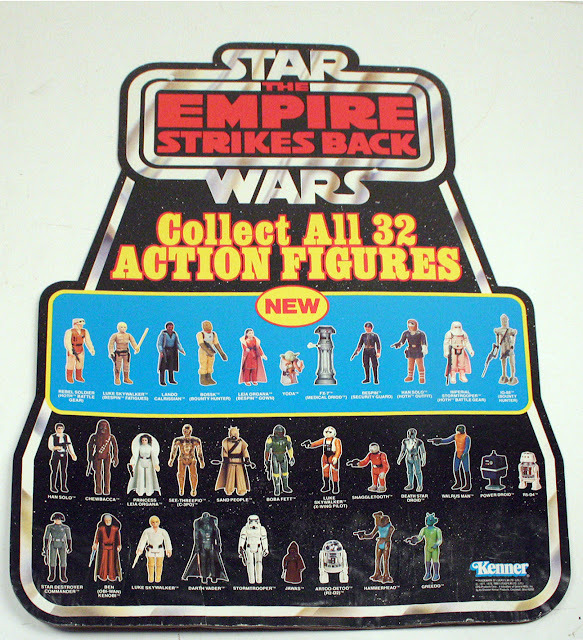 This is the ESB Collect All 32 backer display. This display was very short lived, as most know the number of cardbacks changed more in the ESB line than with either the original Star Wars or Return of the Jedi lines. Because of this there were a number of variations of displays that supported the line. The 32 Back display has great detail and like the 21 Back bell displays, it has a great way of displaying preexisting and new characters in the line. Unlike the Boba Fett 21 Back Header we saw earlier, this isn’t exactly the type of display most new collectors are going to jump into and although the condition isn’t great, it isn’t horrible either. For many display collectors this is one of the last displays that most will ever acquire and because of this, it was still able to command a very solid price even in less than perfect condition. I hope you enjoyed our update for this month, check back soon for our review of Lili Ledy products in the market.